This 1941 Ford sedan delivery is parked just inside the gate at Jefferson County Auto Parts in Alabama. 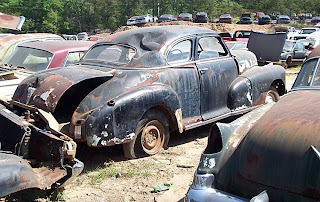 You don’t find many 1940s era vehicles in junkyards these days. This sighting was noteworthy due to the fact that this ’41 Ford retains its original flathead V8. 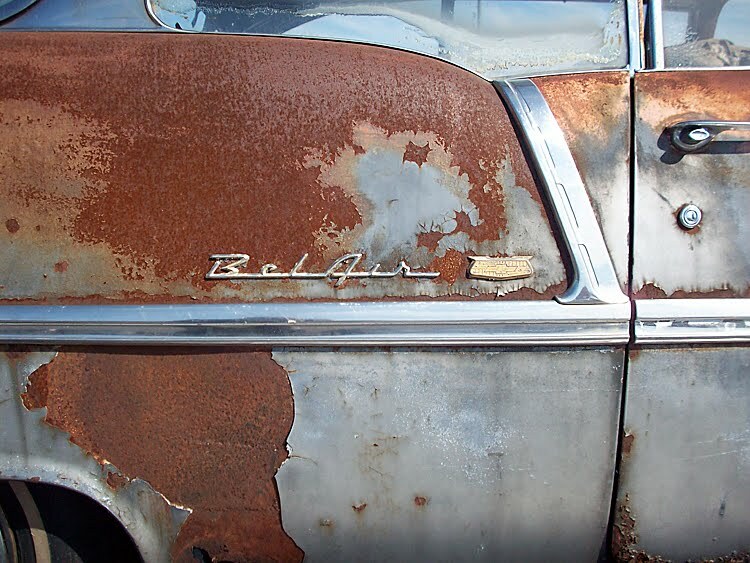 Traces of peeling, vintage, black paint and original hubcaps also remain. 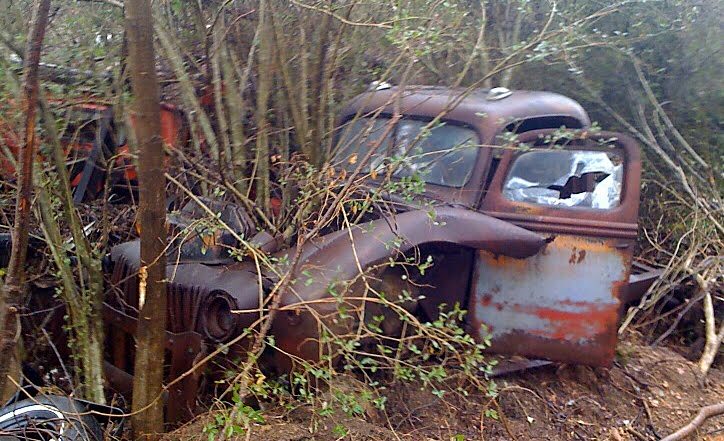 This Ford was probably parked when the drivetrain let go. Years of faithful service and decades avoiding would-be butchering by novice hot rodders have kept this pre-war Ford original. If your interested the ’41 delivery can be bought for $2,000. “Birdeye” Sims watches the wreckers roll in with new inventory. The unusual is the usual at most junkyards. 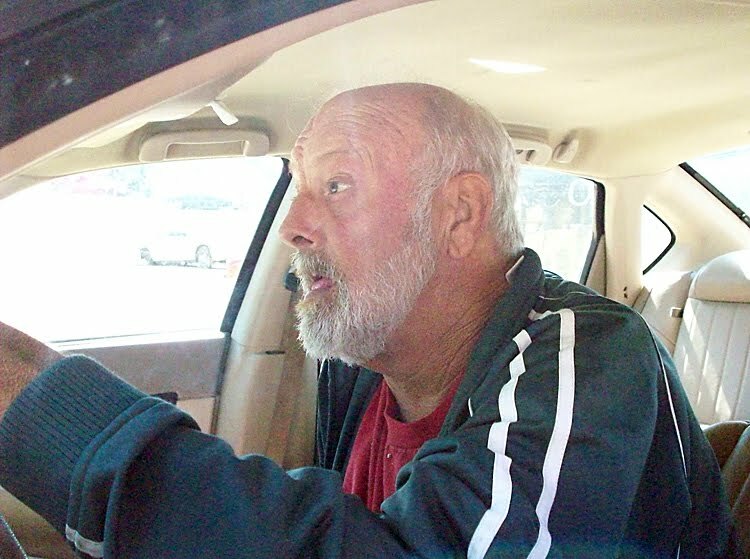 “Birdeye” Sims, owner of Jefferson County Auto Parts, works six days a week from the driver’s seat of a white Chevrolet Impala. Recently, “Birdeye’s” health has limited his mobility and confined his workspace to the Impala. 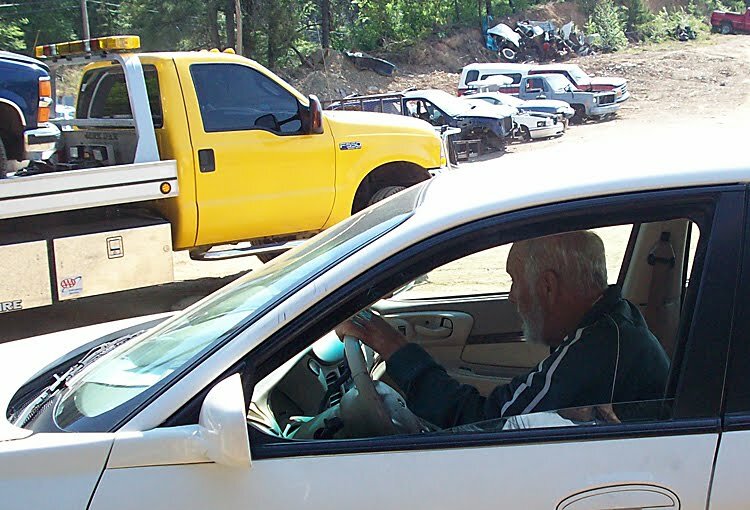 He sits behind the wheel, keeping a sharp eye on a wrecker loading cars. Between draws from his cigarette, he answers a customer’s questions about parts, prices and the large collection of antique cars he has on the yard. When a phone call for a part comes in at the front counter, his daughter-in-law, Wendy relays the message to “Birdeye”. Quick as a blink, she gets an answer back. “Birdeye” tells her if they have the part, where it is, and the sale price. 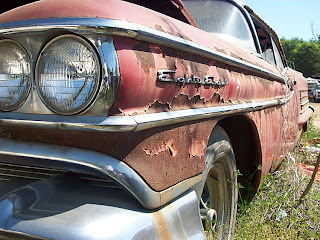 The battered air dam on the front of his Impala proves he knows the junkyard and its roads like the back of his hand. 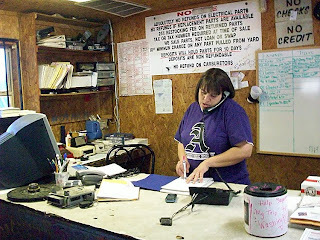 Wendy Sims works the counter, answering calls to Jefferson County Auto Parts. For more 35 years, Jefferson County Auto Parts has been the lifeblood of the Sims’ family. 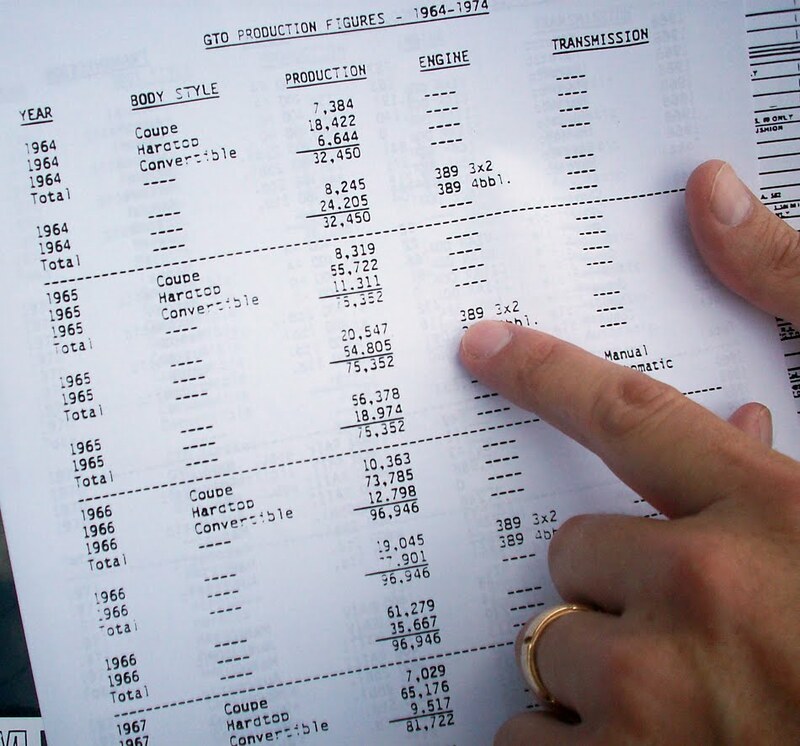 During that time, buying and selling cars and parts has turned into a family affair. His wife, son and daughter-in-law are all part of the day-to-day operation. 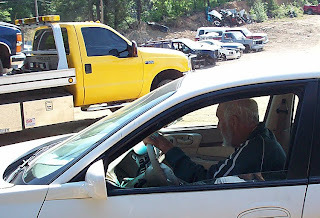 His son, David Sims, has taken over most of the heavy lifting and his share of essential junkyard headaches. Daughter-in-law, Wendy Sims, is the energetic voice that answers the phone. She directs the customers questions to “Birdeye”, in the Impala. “Birdeye’s” wife, Brenda, can often be found behind the counter helping customers, too. On the day I visited, scrapping cars was the top order of business. A junkyard has to make money, even in tough economic times. 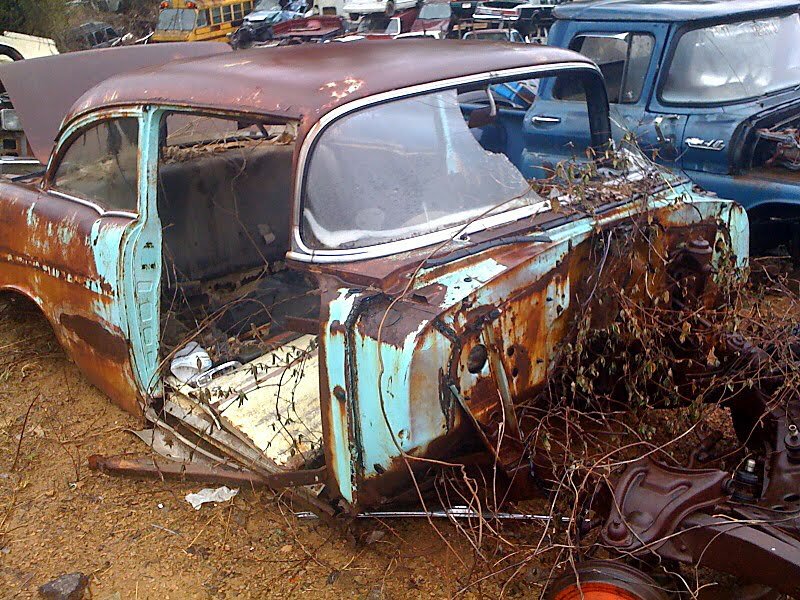 Scrap prices were $11 per 100-pounds for cars. A 3,500-pound car would bring in $385 for the yard. Goodbye cars, hello money. 1958 Oldsmobile Eight-Eight, 2-door hard top at JeffCo Auto Parts. Was $850. Believe it, or not. 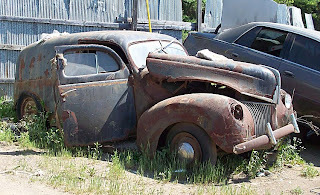 A 1941 Ford sedan delivery at Jefferson County Auto Parts. Most junkyards scrapped their 1940s and 1950s vehicles long ago. 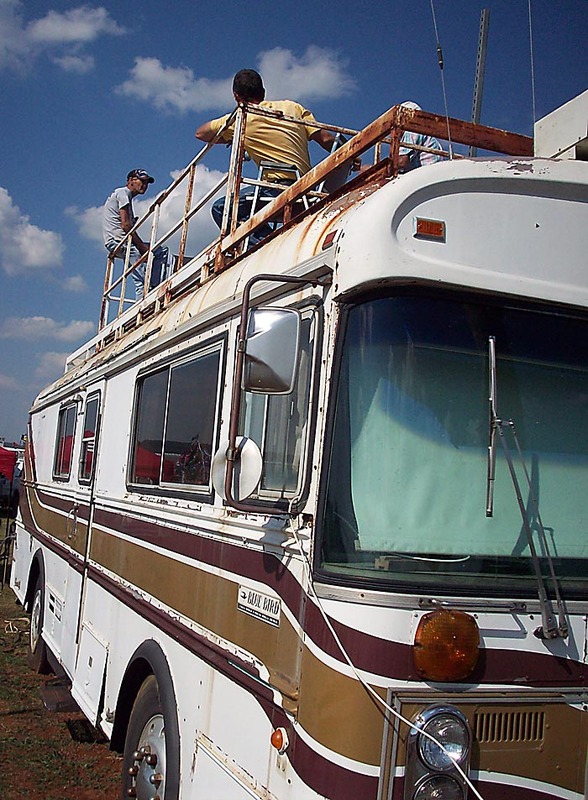 You don’t have to look far to find the old stuff at “Birdeye's” junkyard. A rare 1941 Ford sedan delivery sits beside the front gate. How often have you seen one of those? Need parts for a 1958 Oldsmobile Eighty-Eight? How about your 1959 Pontiac Bonneville or 1951 Willys wagon? Most of the old stuff, 50 or more cars, is gathered to the left of the main building. Take a left, and the old car section, is on your right. If your willing to walk, you may discover more than a dozen jaw dropping classics. A 1951 Ford parked on a mound of red clay. A 1942 Chevrolet coupe with a slightly mashed roof waits for restoration. The old cars are worth the trip. Meeting “Birdeye,” priceless. Don't get lost, use the map. Remember the New in New Mulga Loop Rd. 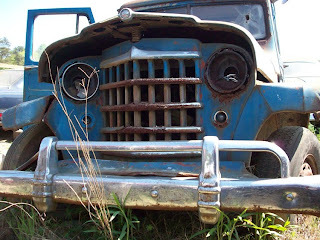 I got lost and found another junkyard that I will share with you soon. Hours - Mon.-Fri. 8 a.m.-5 p.m., Sat. 8 a.m.-3 p.m.
“Birdeye” Sims, also known as “Pop,” at work in the Impala. 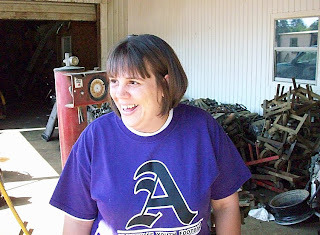 Wendy Sims, the voice of Jefferson County Auto Parts. Slightly wrinkled 1942 Chevrolet coupe at Jefferson County Auto Parts. 1950 Chevrolet sedan at Jefferson County Auto Parts. 1951 Ford at Jefferson County Auto Parts. 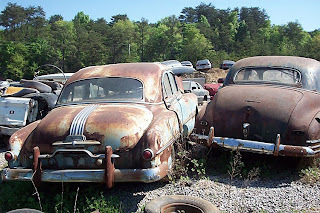 1951 Pontiac Chieftain, left, at Jefferson County Auto Parts. 1951 Willys wagon at Jefferson County Auto Parts. Was $500. Found this classy 1959 Pontiac Bonneville door panel at the junkyard. Not many 1959 Pontiacs look this good in a junkyard. Was $650. 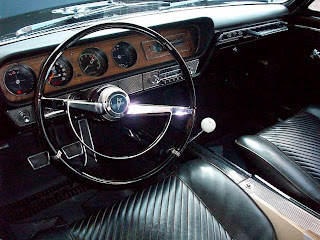 1960 Dodge with push-button shift transmission. Jefferson County Auto Parts owner, “Birdeye” Sims. 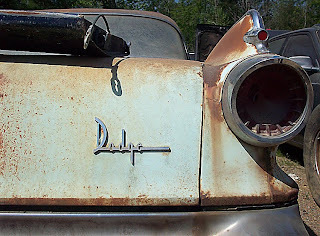 1960 Dodge at Jefferson County Auto Parts. Looks like a 1936 Chevrolet hiding in the pines. 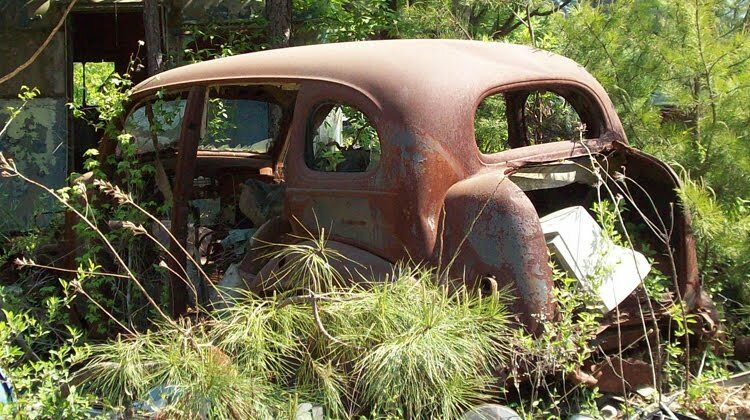 Where do junkyard dreams come true? 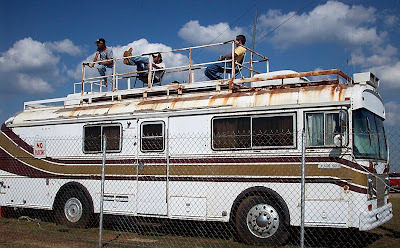 Talladega weekend on top of this bus means work for these guys. An tattered Blue Bird conversion bus caught my attention as I cruised through the infield area at Talladega Superspeedway. Rust and flaking paint are not uncommon on many of the recycled school buses that make the trek to Talladega for NASCAR races. This one was different because it lacked a colorful paint scheme to mimic the owners favorite driver. 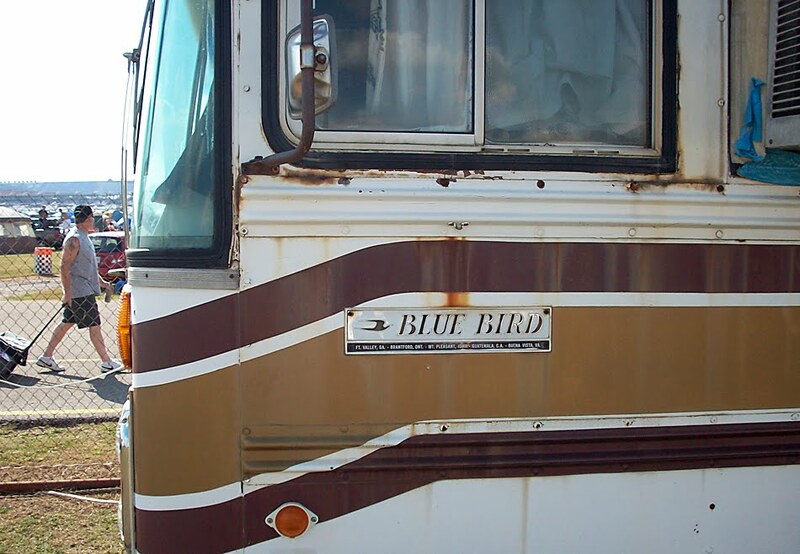 This Blue Bird has it's own colorful history. 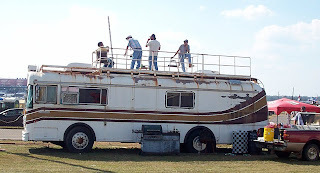 It hasn't moved from its location, near Turn 3 in years and was once owned by NASCAR president Mike Helton. A trio of men were standing on its rooftop platform, sipping water and 7UP. All attentively watching the Nextel Cup practice. Not a beer in sight. 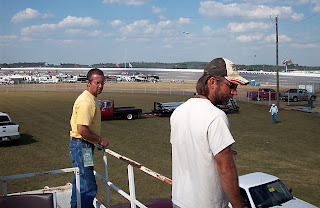 These guys were working for Cheaha Construction, located in Munford, Alabama. I was invited to chat, up on the weathered platform. 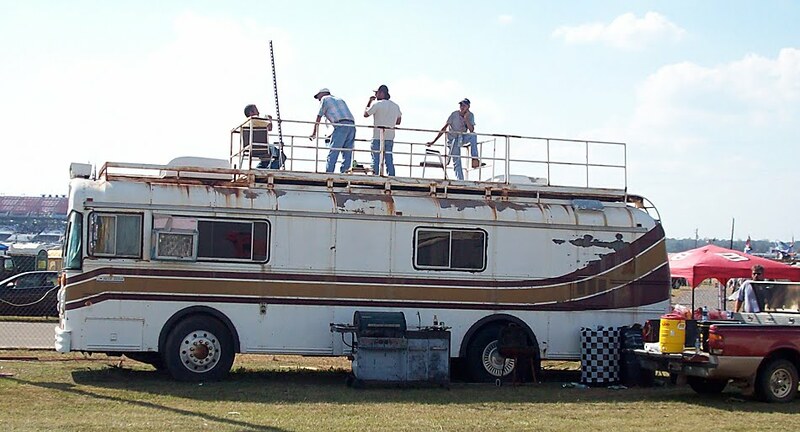 “On race weekend, it's our job to fix the speedway wall, should a car damage it in a collision,” said Ken Dymarski. Not long after he said that, Dale Earnhardt Jr. blew a tire and hit the wall in Turn 4. Armed with binoculars, the men assessed the damage to the wall. In some situations, these guys have to weld sections of steel back together. Two men in a red Dodge 4X4 pick-up truck, loaded with foam soft wall material were on standby. All clear. Earnhardt Jr.’s car didn’t damage the SAFER barrier or the retaining wall. No need for repairs this time. 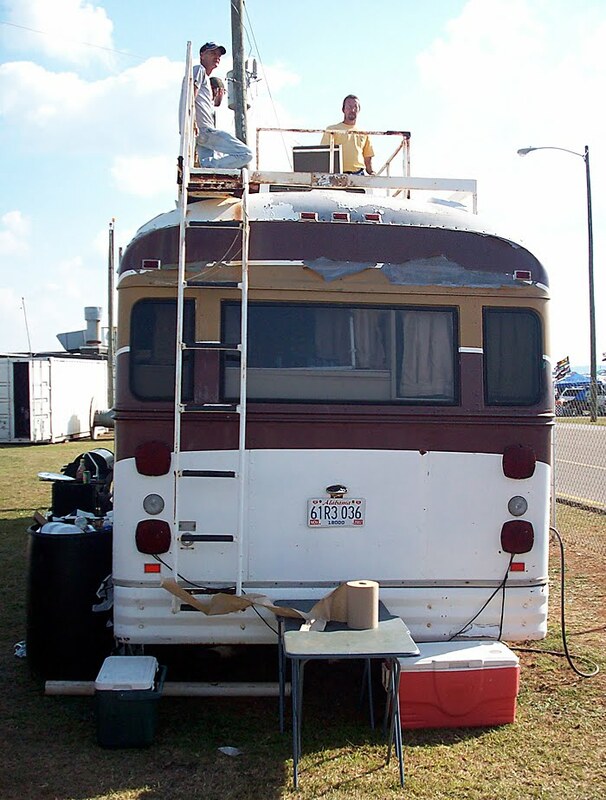 Home base for Cheaha Constructions track operations has been this old bus for the last twenty years. 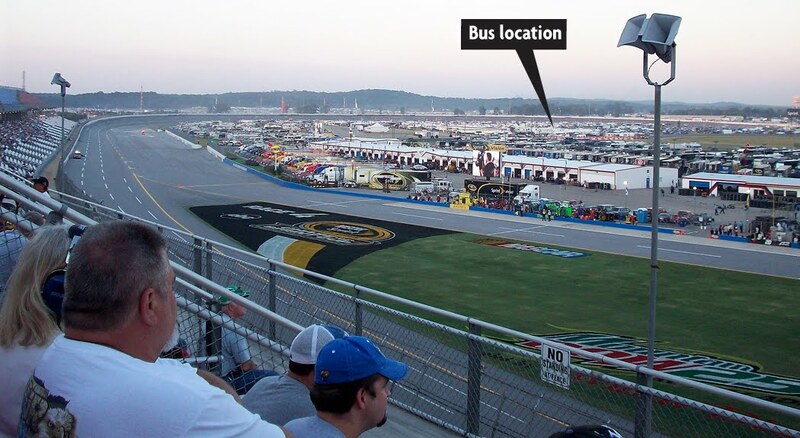 The owner of Cheaha Construction bought the bus from NASCAR president, Mike Helton, more than two decades ago. 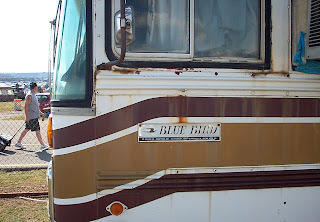 At one time the Blue Bird bus was a communications vehicle for NASCAR. I climbed down from the roof and took a peek at the interior. 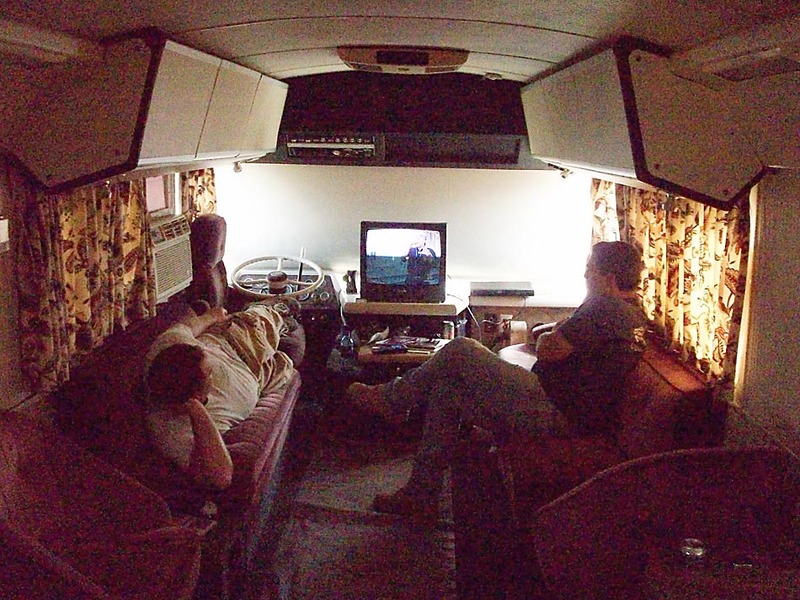 The retro vibe from the outside continues throughout the cabin area. 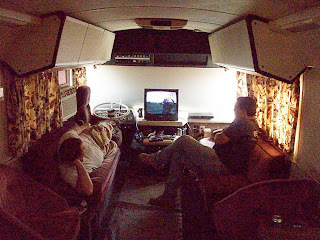 Two Cheaha workmen were enjoying a break from the heat and watching TV. Vintage 1970s curtains block the light and colorful infield scenery. Next time your at Talladega take look at this time capsule. Who knows how long this almost permanent fixture will remain? 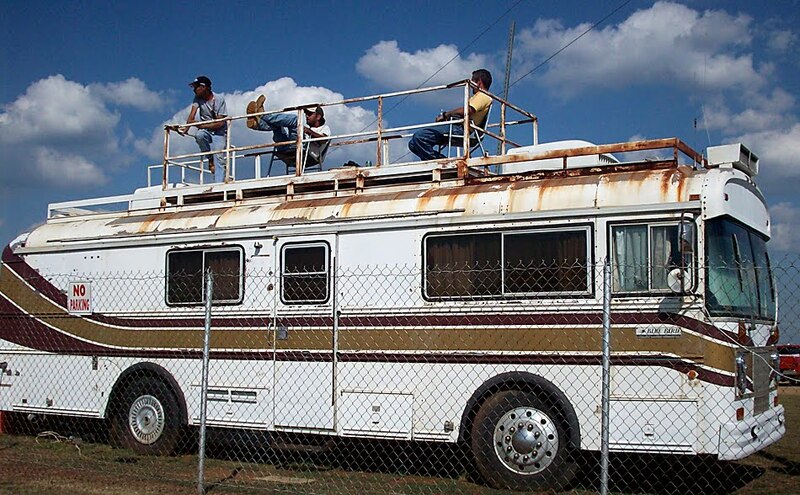 Cheaha Construction workers take a break inside the Blue Bird bus. 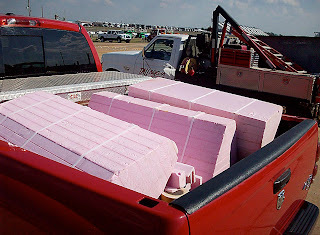 Foam for the soft walls is ready if needed. 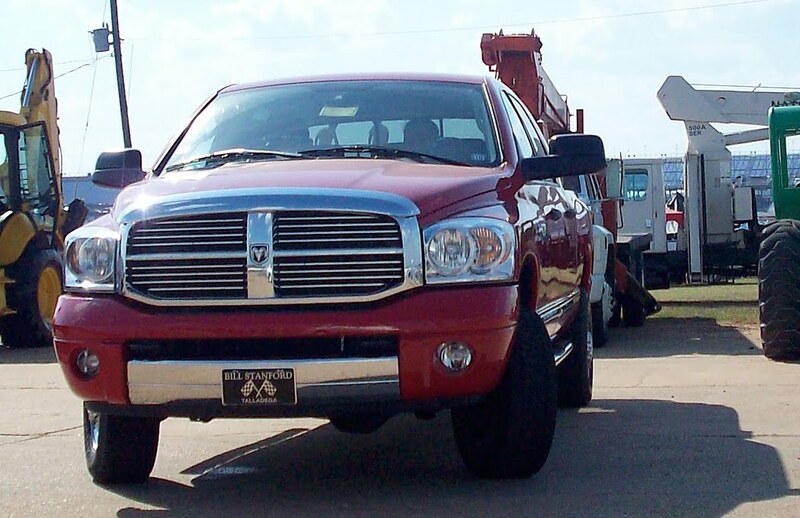 Windows up and A/C cranked, this Dodge waits for disaster. The Cheaha Construction bus is a speck in the 212-acre Talladega infield. The bus where the party never begins. 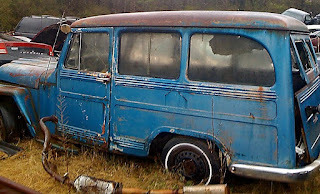 Got a cool old car, truck or bus? 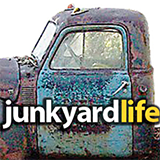 Send info and photos to junkyardlife here. at Doug Willey Pontiac by his dad in December of 1964. A 1965 Pontiac GTO saved Randy Phillips' life. 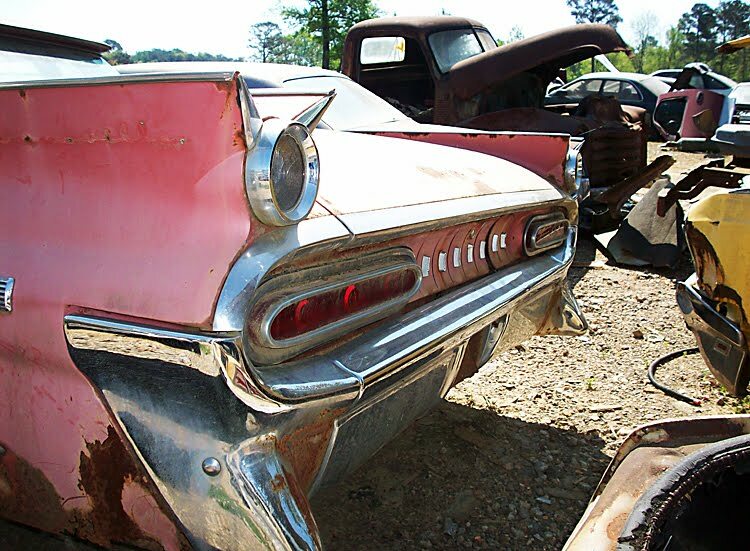 According to family legend, when Randy was a baby, he would crawl out onto the trunk of their 1961 Ford Thunderbird convertible when the top was down. This made for some precarious moments when Randy rode in the Thunderbird. A safer, enclosed car, in the form of a hardtop 1965 GTO, was the answer. Randy's parents, ordered a new GTO in 1964 to replace the 1961 Thunderbird. Forty-four years later, the Phillips family still owns that GTO. 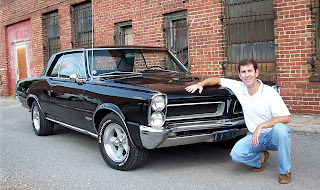 Randy Phillips, now 46 years old, says, "I guess you could say that the GTO was a real life saver for me!" Randy Phillips at home behind the wheel of the GTO his father bought new in 1964. Lucky for Randy, his dad was cool. 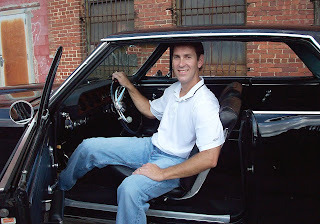 No station wagon for Bill Phillips. 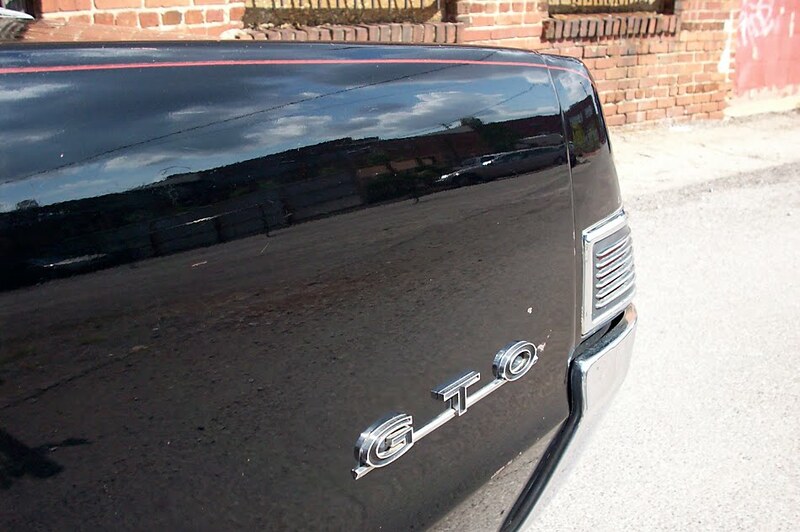 A black on black, tri-power, 4-speed, 1965 GTO was ordered at Doug Willey Pontiac in Birmingham, Alabama. The Phillipses took delivery of the Pontiac on Dec. 5, 1964. Safety was the intended benefit of buying the GTO. Randy's dad also had intentions of racing the family car should the opportunity arise. He was clued into Pontiac performance during the early years of the muscle car era. The 389-cubic inch engine produced 360 horsepower with the tri-power carburetors (three 2-barrel carbs) he ordered. The family's GTO was barebones, without options such as power steering, power brakes or air conditioning. Randy fondly remembers his dad racing on First Avenue North in Birmingham. He cheered him on from the back seat yelling 'go daddy, go!'. A set of Mickey Thompson slicks were used on the car once in 1967. Randy still has those tires mounted on the original 14-inch steel wheels. His dad painted half of each 14-inch rim gold during his hot rodding days. Seeing the black and gold wheels spin was like watching a pinwheel of Poncho horsepower. 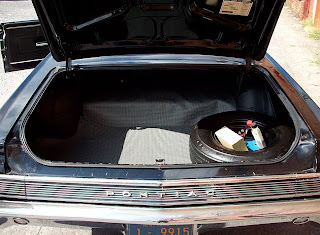 Despite that rubber rebellion, the GTO's original Tiger Paw Redline spare tire remains in the trunk. Phillips' GTO still wears its original factory black paint and hand-painted red pinstripe. This one-family-owned Goat still retains its numbered matching parts and wears the original black lacquer paint. Friends insist a new paint job would further enhance the GTO's value and looks but Randy wants to keep the aged 1964 paint on the car. "A car is only original once," notes Randy. Each modification is a step away from factory originality. With only 85,385 original miles on the odometer, this black beauty has avoided major changes from its showroom condition. Randy replaced the dog dish hub caps and steel rims with American Racing Torque Thrust II wheels. 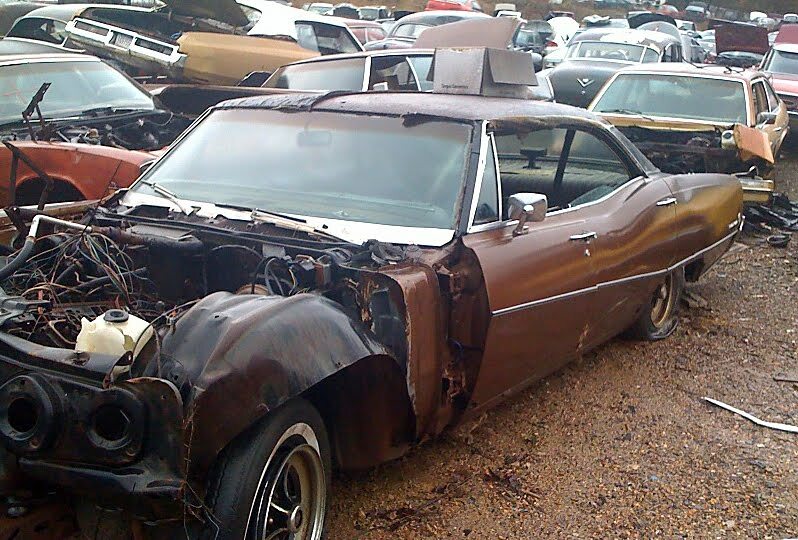 This vintage GTO has not been restored by any means. Wear items, such as torn seams in the back seat have been restitched. 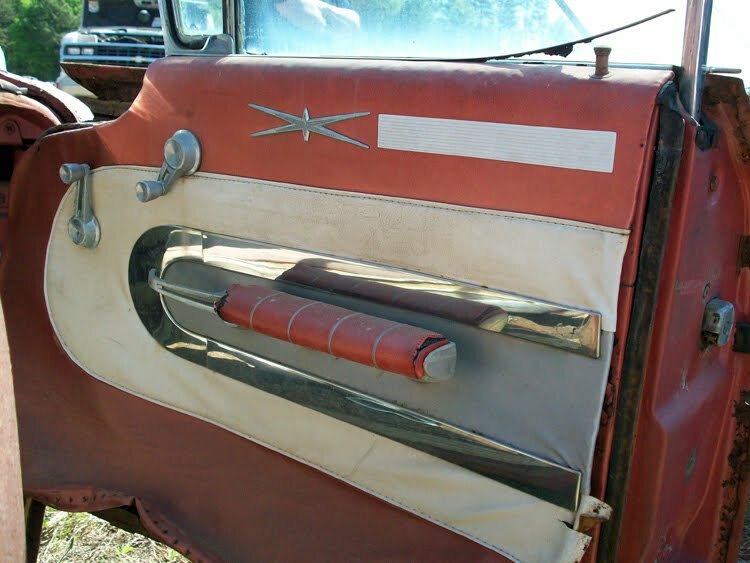 I noticed the original interior and door panels looked factory fresh. Randy says, "They got a good cleaning after the GTO spent 14 years stored in a barn." Phillips' 1965 GTO has just 85,394 original miles. Today, the GTO is used in the same fashion his parents used it: To safely drive the family around town. Randy takes his daughters, Anna and Rebecca, to school, church and to grab dinner in the Pontiac. "My family uses the GTO to 'get groceries' in, just as my parents did, with me back in the '60s. 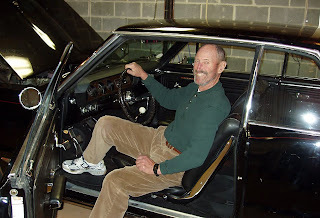 My wife Brenda even enjoys it, but she is afraid to drive it," Randy says. 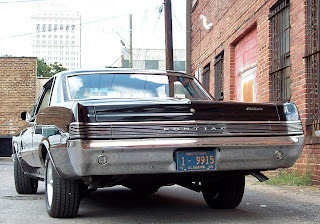 One day the Pontiac Bill Phillips bought in 1964 will be driven by one of his granddaughters. Randy reassures me this Pontiac will stay in the family. "The thrill of driving this car is unmatched by newer cars. I want my kids to experience it too." 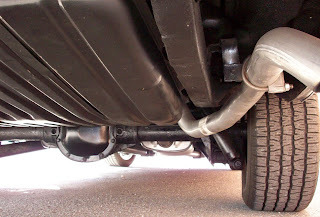 In 1965, 20,547 Pontiac GTOs were equiped with Tri-power. 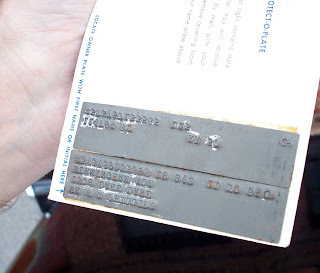 The original blue engine paint was covered by black paint. Hot rodders used this trick to help dissipate heat from the engine. The Pontiac blue paint is visible near the water pump. 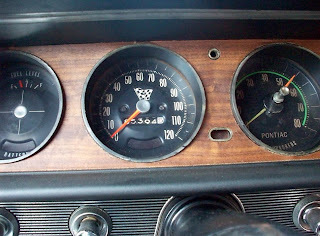 I went for a ride in Randy's GTO time machine. The smell of high octane fuel and the rumble of the 389-cubic-inch engine was sensory overload. A glance at the checkered flag on the speedometer and the chrome-handled Hurst shifter are not-so-subtle clues to the car's performance potential. Just rock-solid evidence that Pontiac dared GTO drivers to test their car's limits. At every turn people gawked at the car. If this were 1965, stoplight showdowns would have be inevitable. The 389-V8 with its 3.55 rearend gear ratio will get you to the speed limit in a hurry. As it were, Randy displayed restraint, not stretching the legs of the Pontiac too hard. The Tri-power carbs were well-mannered at idle and tooling through town. My experience riding in Randy's GTO solidifies its place atop my dream car wish list. Bill Phillips took delivery of this 1965 GTO at Birmingham's Doug Willey Pontiac in 1964. 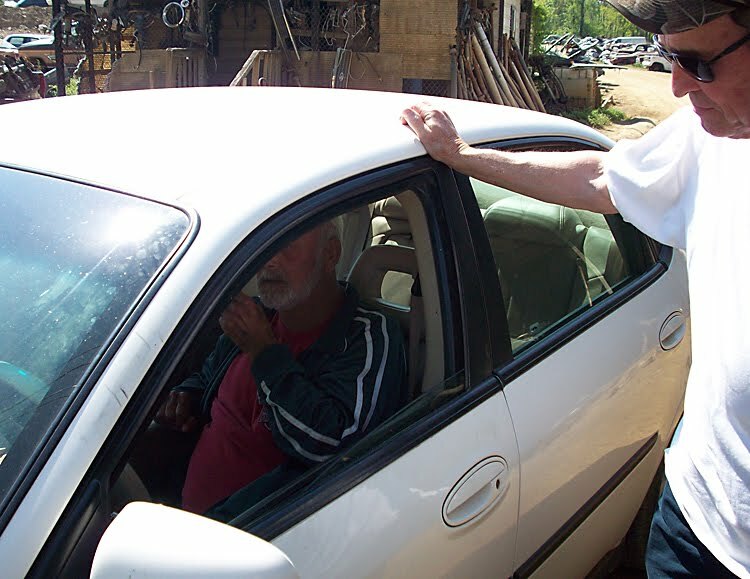 He gave his prized Pontiac to his son Randy two years ago. Two years ago Randy's dad handed him the Pontiac's keys due to health issues. 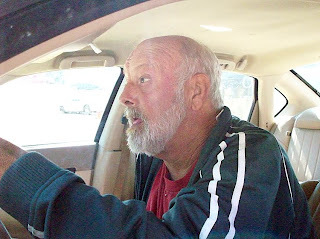 His dad now lives in North Carolina after a career working as an executive for Sears that began as a manager of the downtown Birmingham Sears automotive department. 'Sentimentally, the car has been and is one of the best and coolest gifts and set of memories anyone could ever receive," said Randy. "I will always treasure my dad and 'his' car." 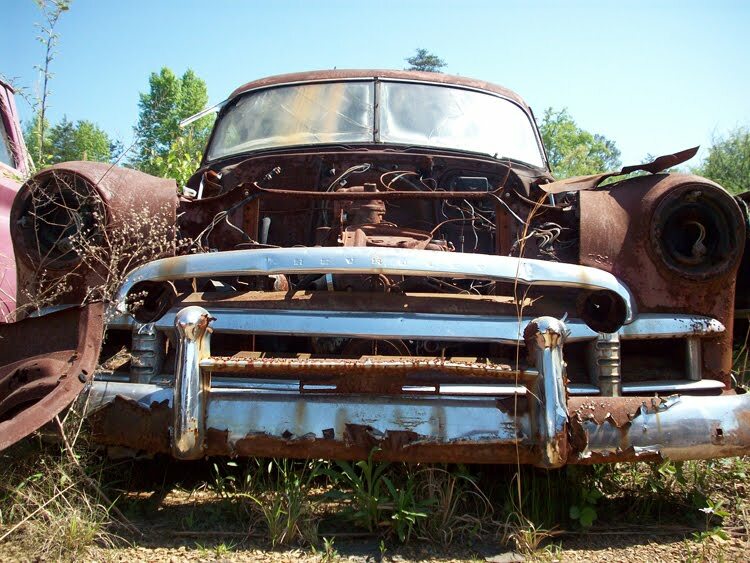 Do you have an automotive story you would like to share with junkyardlife? Send it here. A hand-painted red pin stripe accents the Phillips' 1965 GTO. 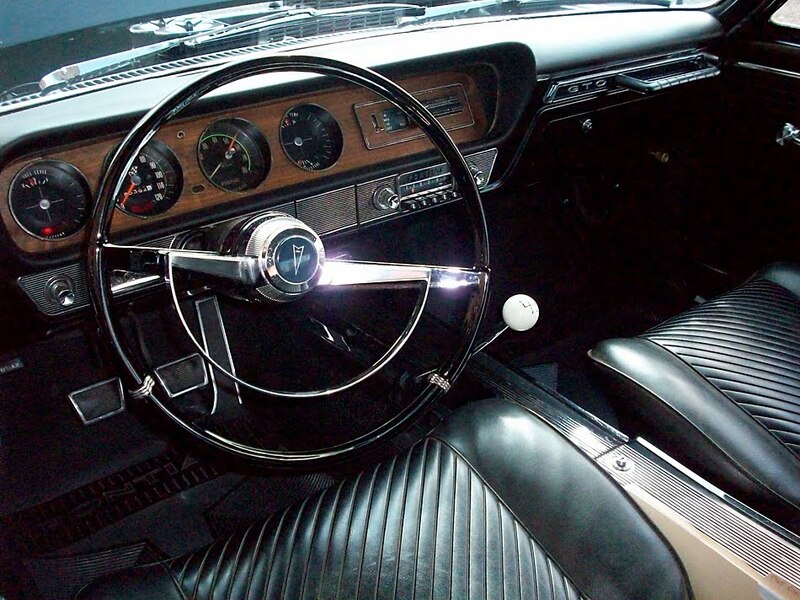 The interior of Phillips' 1965 GTO is original except for carpet and headliner. 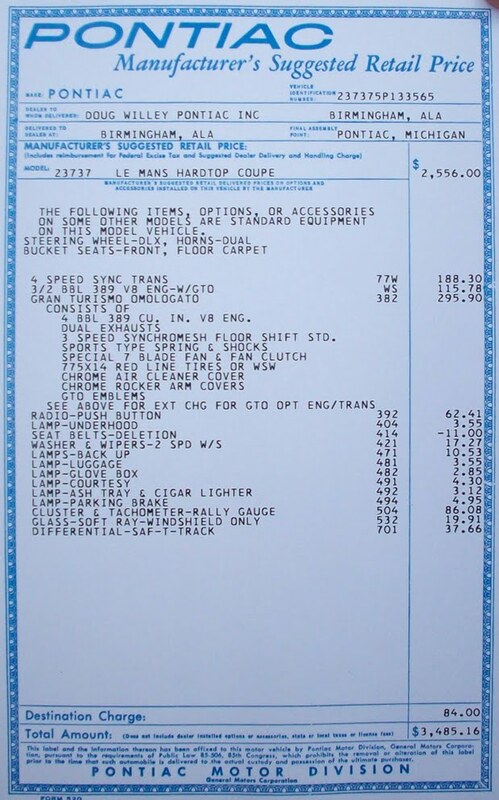 A reproduction of the window sticker by Pontiac Historical Services show the GTO sold for $3,485. Randy Phillips holds the Protect-O-Plate that came with his father's GTO in 1964. The original Tiger Paw Red Line spare tire, Red Line side down, rests in the GTO's trunk. A look under the Phillips' 1965 GTO. Production number breakdown for 1965 GTOs. 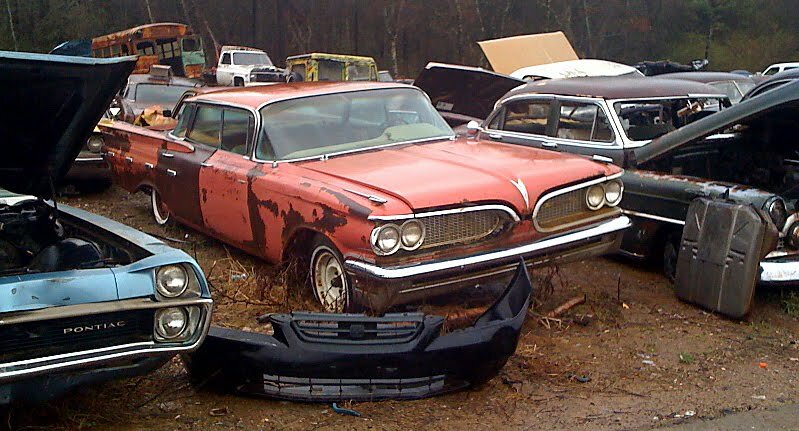 Do you have an automotive story or photos you would like to share with junkyardlife? Send it here. 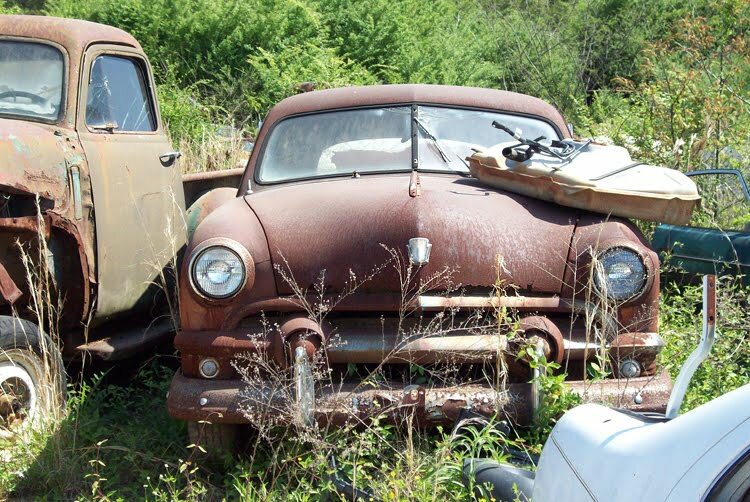 You want to buy a restored 1955 Chevy? $30,000 to well over $100,000 are not uncommon asking prices for well-heeled Tri-Five Chevys. Ouch! 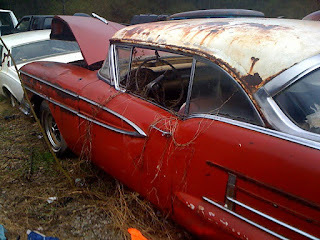 How about a project ’55 Bel Air? Solid, needs everything, shells go for $10,000 and up. Are you kidding? Sticker shock on these babies has sent many gearheads muttering unpleasantries as they walk away from a “project for sale” at the local swap meet. But, can you blame the sellers? 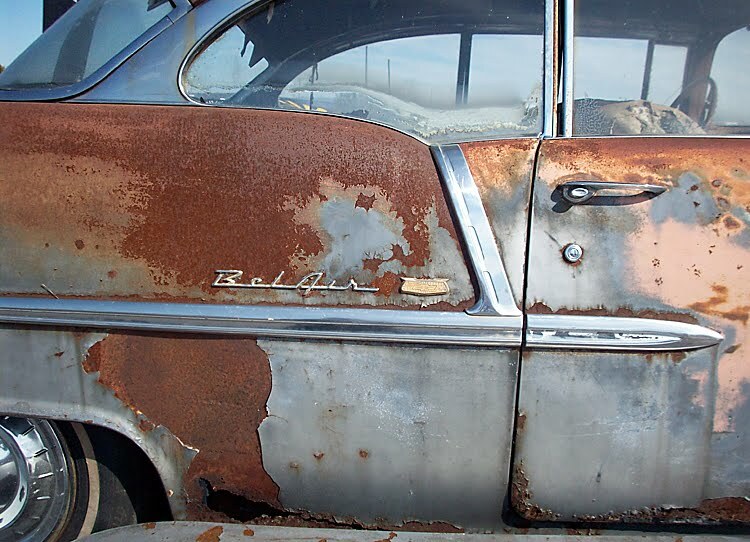 These cars have earned the high dollar respect, rust included. You can’t expect a seller to let go of a ’55 Chevy without making some profit. These are icons of GMs history that forged their reputation at the drag strip and on the silver screen. For the 1955 model year, Chevrolet introduced the small-block V8 engine. The light weight, compact, small-block engine became a signature of Chevrolet for more than 50 years. 1955 models will forever be bonded to the beginning of small-block history. But small was not always better with regards to shoebox Chevys. During the musclecar heyday, bigger cubic inch engines were the norm. Guys in their old ’55s were gunning for the ‘new’ musclecars of the 1960s. 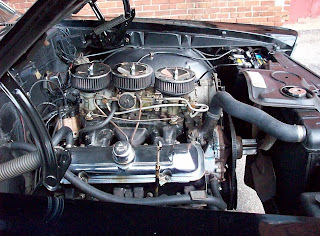 Big-block engine transplants were mandatory, as was cutting a hole in the floor and converting 1955 Chevys to floor shift. The macho, hot rodded ’55s were light, quick and you had room to haul your buddies and your best gal. Don’t forget there’s room for a set of slicks and jack in the trunk, too. What, no tail lights? Where’s the lock on the trunk? 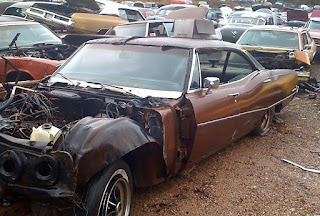 Hood missing but parts of V8 engine included in $8500 price. Art imitates life and before long, fast ’55s played their role in several historic movies. 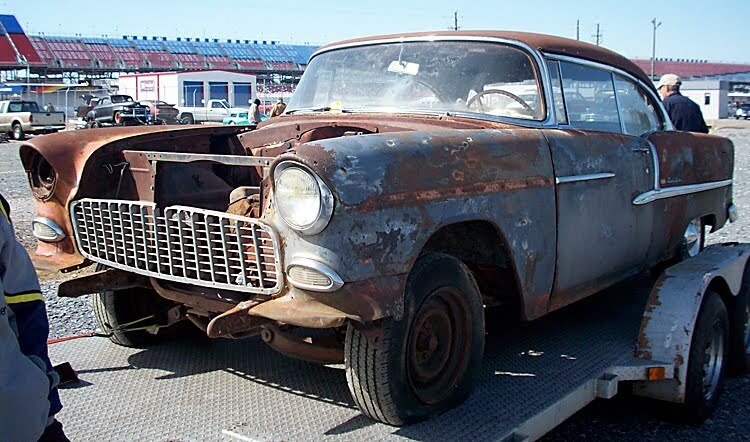 A 1955 Chevy should have won an Oscar for starring in two of the most famous car movies ever made, “American Graffiti” and “Two-Lane Blacktop”. Both featured 1955 Chevrolets hell-bent for speed. The die was cast. 1955 Chevrolets were bad to the bone. Even luke-warm car enthusiasts would jump at a chance to own a shiny black or grey primer ’55 Chevy 2-door post, movie car replica. Reality is, most folks can’t buy what they want. 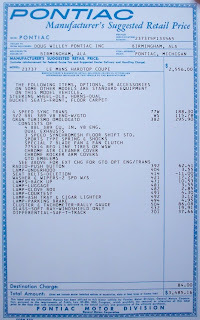 An average car guy buys a project car because its cheaper than a restored or original, classic vehicle. Fitting a cheaper project car into the family budget also makes divorce less of an option than a $60k Nomad would. Well, get ready for a reality check. 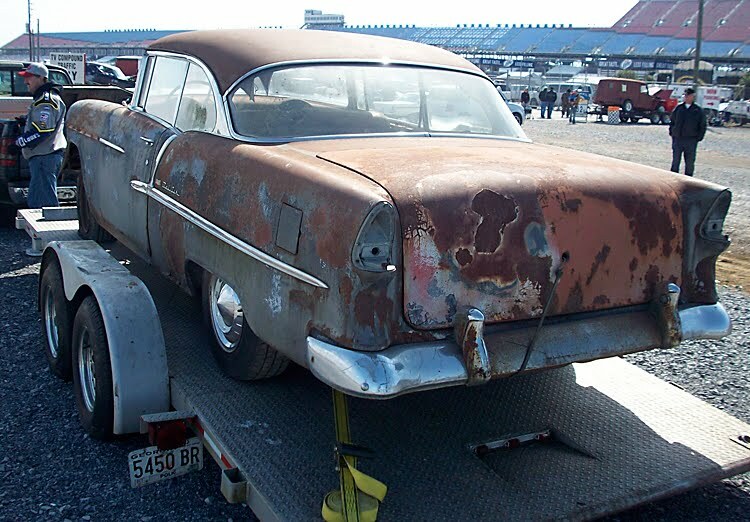 Old, desirable project cars, especially 1950s models are getting pricey. 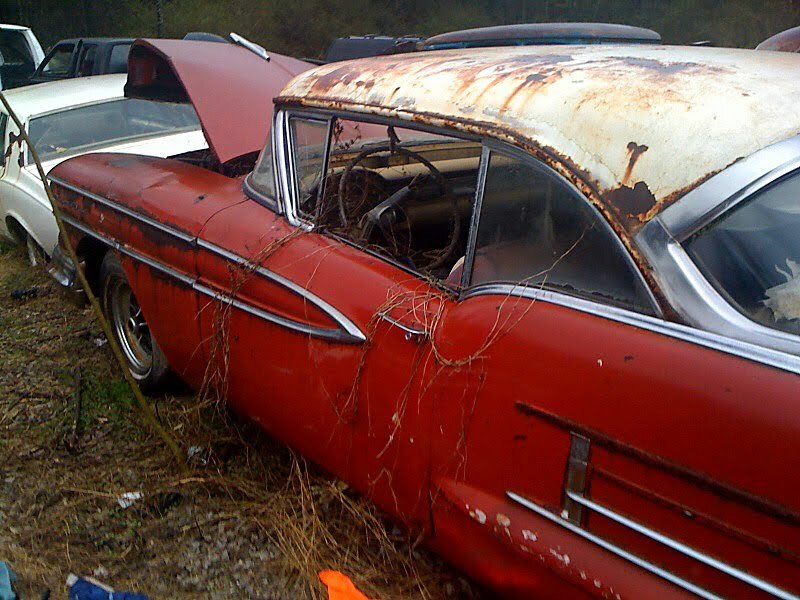 Get out the big checkbook, this rusty ’55 Bel Air project in the photos has an $8,500 price tag. A steep entry fee, but at least it gets you in the club. Even that has a downside, the waiting. You fool yourself into believing that you don’t want to hop into a restored ’55 right away. The opportunity to work on the project and make it your own vision is what you want most. It could be months or years before you drive the car. You could lose interest, run out of cash or die before its finished. Ugh! So what is a car guy to do? Wait for a miracle or myth to come true? You could find that little old lady who doesn’t know what her “old 1955” car is worth. Sure, that’s gonna happen. Or someday, you could meet a divorcee willing to part with her husband’s hot rod for “$100 of revenge.” Never happened, never will. My advice, if you want one, buy one. They won’t be getting cheaper anytime soon. 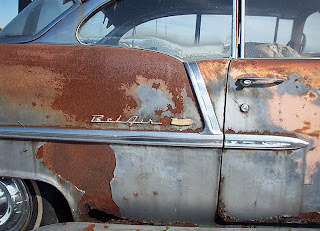 Holes are where you can’t see the rust. 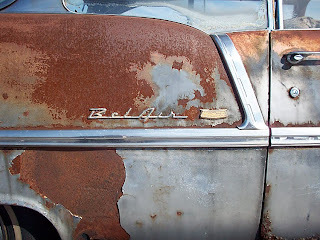 This 1955 Chevrolet Bel Air has cornered the market on legit patina. 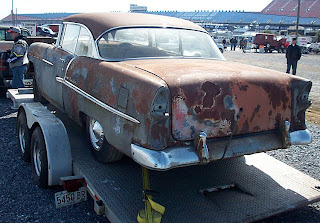 Some good ’ol boys from Georgia trailered this rusty 1955 Chevy Bel Air hardtop to a big auction, swap meet at Talladega Superspeedway recently. Price $8500. Read more about that event here. Send you photos and stories to junkyardlife here.